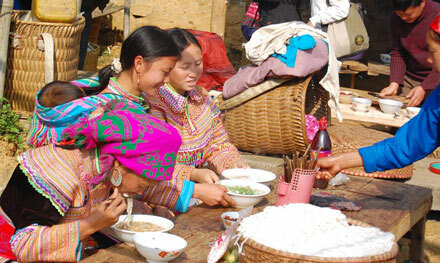 Sour Noodle is cooked relatively sophisticated, representing for food and drink art of Sapa peole.Not exactly sour soup came from and of the nation, but, with most of the highland ethnic groups: Hmong, Dao, Tay, Nung ethnic or even used to live on the mountain headlines such as:Thu Lao, Ha Nhi … sour soup is rustic, indispensable. 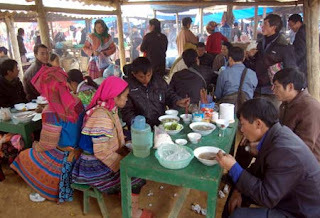 Each session, she, her pulses beautiful in colorful costumes, swooping on sour soup, just as the men gathered around the wheels straight alcohol. However, the difference is to acidic water, the graceful and sweet, pickles cat salt from vegetables, planting vegetables on the grill, sliced ​​only about half the size knuckles. Along with crushed roasted peanut, raw material is equally important in the bowl of sour soup is the boat blow (aka cylinder head). Train soy which are processed, soaked from soybean. For a delicious tofu soy ships, processing stages of upland people quite sophisticated and elaborate, from selecting beans, spice additions and processing of finished products take up to several months. Cylinder head bowl mix together sour soup is dark golden brown as sugar, wing beans crushed and filled scented water pile up. 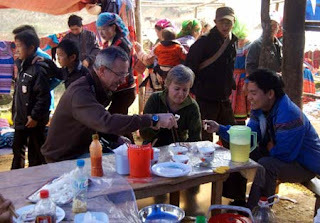 And finally, the raw material indispensable for making the perfect noodle taste is sour chili sauce – is the like of the highlands such as chili peppers Muong Khuong, ensure spicy with bright red.